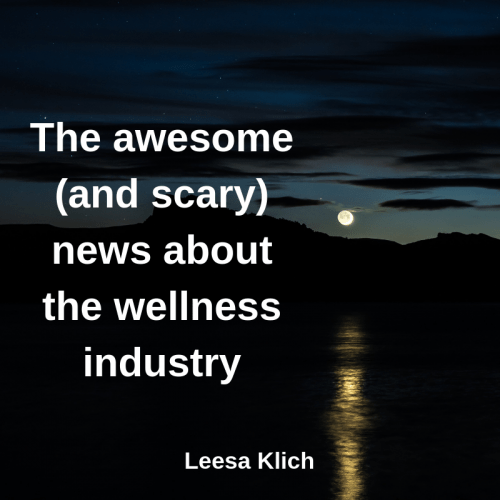 Have you heard the latest numbers on how big the wellness industry is now? “In the face of longer lifespans, and rising chronic disease, stress and unhappiness, we only see growth for wellness ahead,” said Yeung in a press statement. These numbers totally make me both excited (from a big picture perspective) and scared for individual entrepreneurs like us (from a more detailed perspective). Don’t get me wrong – it’s fabulous that the industry is growing. I’m pumped that there’s an increasing focus on wellness and more and more people are spending more and more money to improve theirs. At the same time, I’m seeing the industry becoming consistently more and more difficult for each individual one of us to stand out and be remembered (or even recognized) in this market. A massive market like this means increasing sales corresponds with increasing demand… and supply (would economists agree?). Now there are more people offering health products and services (have you seen the “health & wellness” section of any bookstore lately? It’s huge!). And many of those people who are the latest “Instagram stars”, “Foodies”, and “Wellness gurus” are selling stuff like hotcakes, but have little to no credentials. Just because they figured out how to clear their skin, drop 50 pounds, or ease their digestive distress surely doesn’t make them qualified to dole out health advice to the masses. Yet many of them claim millions of dollars in sales. But that’s kinda what you get from a mostly unregulated industry. Anyone can pay a few dozen dollars a year, put up a website, open social media accounts, and say almost whatever the heck they want to to get sales. And if you’re good at sales and marketing, that doesn’t mean you’re a trustworthy wellness authority who gives credible advice. What makes me a credible expert in my field? How can I stand out and be recognized as the expert I am? Why would my audience remember ME when there are so many people competing for their attention promising to solve their problems? These are the EXACT freaking questions I asked myself this week when I heard the news. So, I wanted to share some of my plans and new things I just learned from researching this topic so you and I can confidently answer these questions. My first lesson for you is to do just that – niche down until it hurts – on Instagram, and of course, in your business in general. As Tim Ferris also says, “When you niche down, it becomes less difficult for your target customer to find you, and easier for you to charge a premium price”. Honestly, this is so true. There are so many wellness professionals out there who either claim to be able to help people with any health goal under the sun, and while that *may* be true, it’s not a great way to market a business online. Especially in such a massive industry. Pick someone and something specific you can speak to. You can imagine that young adults with skin problems aren’t going to use the same words as competitive athletes, who aren’t going to have the same goals as those who want to age well midlife and beyond. Your language will be too generic and won’t resonate with anyone. Doing good work and really helping people by being THE expert is probably a good place to start IMO. Let’s face it – it’s easy to confuse the public with fake health news to stoke fear and mistrust. Then you can convince them to buy your thing if you hit the right pain points and benefits on your sales page or webinar. But that’s not just icky, it’s totally unethical when it comes to people’s health and wellness. I mean, they can lose more than just money if they have a bad reaction to something their “wellness guru” recommends. This is why it’s so important to stay within your scope of practice, have disclaimers and liability insurance, and only share credible health recommendations. During this time, I was networking with other foodie Instagrammers, and one friend who was growing rapidly told me: You know, your content just isn’t that good. A big ouch for sure – but this remark was one of my turning points. I couldn’t just blame the algorithm. Instagram wasn’t out to get me. I needed to change my content in order for my account to grow. How is anybody going to think you’re an expert in your field if you inconsistently pump out crappy content that’s generic and forgettable? Your blog, website, and social media feeds are your 24/7 online business cards. The quality of your content reflects directly on the quality of your expertise and brand. Don’t forget to use a digital content strategy to re-purpose content on many platforms for consistent messaging! Having an evidence-based practice is super respectable and confidence-building, but that alone won’t make you stand out. You also need to be YOU. You need to be human and share your personal stories and perspectives. Be honest and let people know why you do what you do. Teach your audience what you’re learning so they can learn with you. And don’t forget to swear sometimes (or not… maybe that’s just me???). Don’t aim to please or impress. Aim for truth and transparency and relevancy. Expect detractors and armchair critics and unsubscribes. Welcome all of this because the people who matter and “get you” will stick around. Customers don’t buy a product, they buy into YOU. They’re not sticking around. And why should they? Is all of your hard-earned knowledge and experience worth anything to potential clients if you’re not truly in it with them? By “amazing people” I mean your audience, potential clients, current clients, everyone that helps you with your business (i.e. writers, VAs, social media strategists, etc. ), colleagues, and even your competitors (if you believe they truly exist). But, if there’s ONE thing I’ve learned in building my own business(es), it’s that unless you’re actually out there interacting, engaging and socializing with your people (= your target audience and hence, your ideal clients), then they simply won’t be open and receptive to getting to know you, and won’t readily trust you. You can do this live and in-person, or online! Try reaching out to them (the right way), inviting them on your blog (the right way) and being a guest on their blog, vlog, or podcast. Even publishing reviews of awesome in-person events or products your audience would love (and tagging the hosts/authors in your social shares of that post). 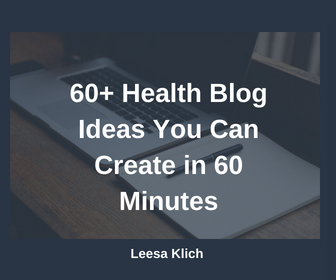 Leave thoughtful comments on a consistent basis not only on social media but also on blog posts. Respond to every meaningful comment (on Instagram it’s easy to spot the bot generated comments. You can ignore those). Follow and reach out to people who are in the same field or in an industry related to yours because there is the potential to learn from and collaborate with them and because you will have lots to talk about. Do you remember days before Instagram stories and Facebook live? Ya, me too – because that was just a couple of years ago! Just think about how fast the online world changes. Now it seems like you have to have some level of content marketing mastery in order to have more than your besties from waaaay back know about you and what you do. In the grand scheme of the world, being that niched, credible, caring, networking wellness expert should ultimately help not just our audience and ideal clients. We should be working toward a movement of better health for everyone – even people who can’t afford our products and services. Let’s keep putting out great trustworthy research-based content so everyone online can learn from it and be inspired by it. That’s why I’m in this industry. Do these wellness industry numbers excite you or scare you? What do you plan on doing to be an expert that stands out and is memorable? Do you have other pieces of advice to share?